I am trying to think of a good use of my cargo bay for my large ship. I'm thinking I will make an e2 sequence to make a (holo? )bot or truck move/stack boxes. I'd like something off-ship that acts a bit like an airport x-ray machine. 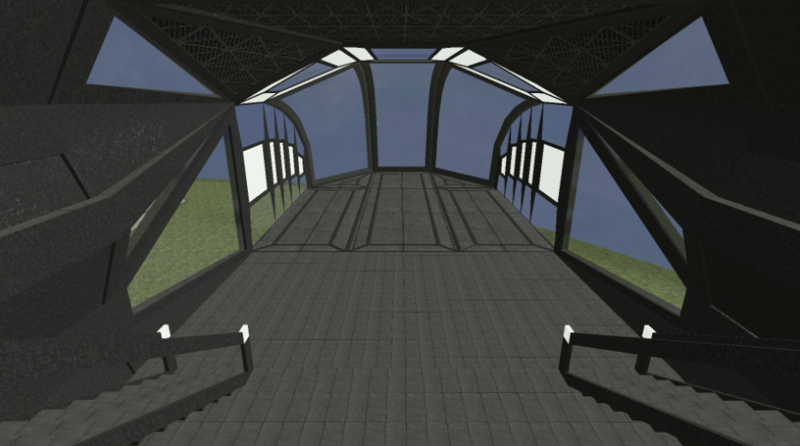 Anyone else have ideas for cargo areas? Especially in the upper areas, besides stacking boxes 400 high? I've seen a few SB users talking about map development the past week. I would also be interested in this, but have not been in Hammer for at least a year. If you are interested in contributing, please reply here and list any experience you have, if any. Showing sernakids (not a forums member - yet) some UI e2 fun. This has been an ongoing project. Expression 2 (E2) Code / Prop Share e2 functions? Are there e2 functions to share props? Then have navchair:entity linked to that chair. 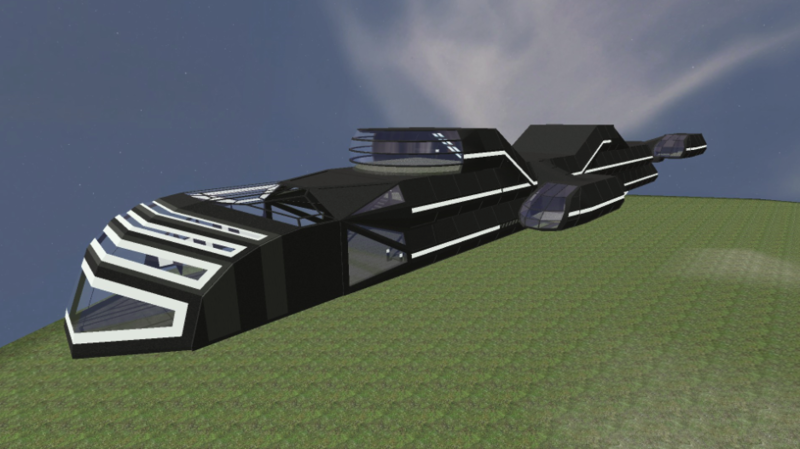 Last night I got through at least a draft of a new ship hull I have been working on. I'm quite pleased that this has come together in about four days where most of my other ships have taken weeks (yes, just for the ship hull!). I think it may also be one of the biggest ships that I've built! Are any of you working on a new or improved ship? I'd love to see what people are building! As stated, at the moment these are ideas, nothing actually coded. I'd love to hear ideas that you all have for e2 use, as I may be able to help you out! 2) Some sort of teleporter control where a person stands on a teleport pad (origin) and then a second player determines the destination on the planets' surface with their cursor. I realize this could get a bit mingey. I'm looking for someone to build me a reasonably comparable model of the Raza ship from Dark Matter - any takers? Expression 2 (E2) Code / Trying to get a list of planet names? I'm trying to use PlanetName = MyEntity:sbEnvName() to grab a list of all planet names in a map, but most everything I've tried to plug in for MyEntity returns an empty string. I've tried creating holos at the planet centers and then using PlanetName = Holo:sbEnvName() but that also returns an empty string. 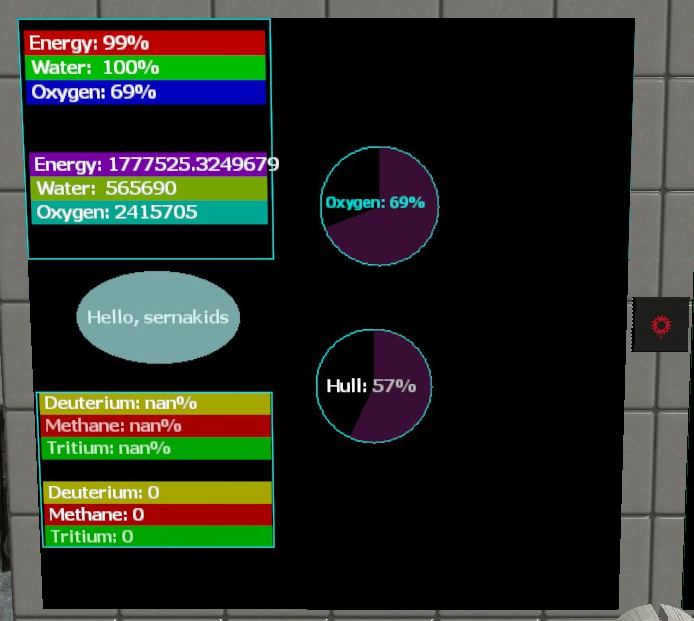 Is there another way to get all of the planet names? Reason: Server Crash trying to produce "singularity nuke" or something similar by parenting 100+ missiles together and exploding them all at once. In a build bay, destroying other players' creations. https://gyazo.com/7a1fc38f61282d4b06d530a1cf429cb6 My console, spammed with this "creation"
https://gyazo.com/309776daeb3c11b4f4e1afb6b09eac23 Him carrying this "bomb"
Place two target finders, an asgard teleporter (and power), and then place the e2 on the asgard teleporter. The chip will auto-find the two target finders and auto-wire the teleporter. If you have more than two target finders, results may not be consistent. It should find the two target finders closest to the chip. Step on either target finder to go to the other. NOTE 1: The E2 chip only "finds" the target finders once, so if you move them, you will need to reload the chip. Let me know if you plan on putting this in a moving ship and I will change that. The E2 will constantly update the position of the chip every second. NOTE 3: I couldn't get it to trigger automatically when I stepped on the target finder, hence the Finder and LastFinder variables. If I could remedy this, I could get rid of the interval() statement. v1.1 still idled under 10 ops when I was testing. entity:IsAsteroid() - Is the entity an asteroid? I have not really played the mining addon all that much, so any requests for additional functions will be considered. Had problems with the 10x missile pods. Adv. Dupe does not wire these properly, so I have to re-wire them (Fire / Aim Vector) after each dupe.